Trufibre is a combination of different natural sources of fibre. Fibre is recommended as a part of everyday diet. Lack of sufficient fibre may lead to obesity. Fibre helps you keep full. 1.Psyllium husk or isabgol is rich in soluble fibre. This fibre helps in reducing appetite, improving digestion and cleansing the system. An excellent choice for healthy weight loss. 2. Basil seeds (tulsi seeds) and gum acacia/gum arabic (gondh) are helpful to reduce toxicity and internal inflammation, one of the causes of obesity. Gum arabic was shown to reduce body mass index and body fat percentage too. 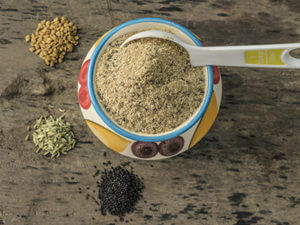 3.Black cumin seeds or shahi jeera help in reducing blood pressure, supporting healthy digestion, and treating diarrhea. This variety of jeera has high content of antioxidants. It also has anti­diabetic and anti­inflammatory properties. 4. Cinnamon or dalchini is good for the heart since it helps to reduce levels of total cholesterol, LDL or bad cholesterol and triglycerides, while improving HDL cholesterol. It has an active compound ­ methyl hydroxy chalcone polymer (MHCP)­which mimics insulin. Cinnamon helps stimulate fat cells in diabetic individuals to respond to insulin, enhancing the removal of glucose from the blood. 5. Fennel fibres or saunf fibres bind to bile salts (produced from cholesterol) and decreases their re­absorption in the colon. This action helps lower bad cholesterol levels. 6. Fenugreek or methi seeds have oestrogen­like properties; it helps in PMS and eases menopausal symptoms. 7. Ginger acts as an anti­inflammatory agent that helps reduce swelling and inflammation in people suffering from thyroid problems or arthritis. It helps in weight­loss and maintaining healthy blood sugar. It helps with chronic indigestion. A regular run-of-the-mill tech enthusiast with an eye for the corporate summit.